Secretary of State for Work and Pensions, Stephen Crabb MP. Photo Credit: Number 10. Ministers will entirely cancel £4bn of cuts to disability benefits and no longer have plans to make savings from the welfare budget, Stephen Crabb, the new work and pensions secretary, has said. Crabb also acknowledged the government may not have had a sufficiently human approach to welfare cuts in the past, after Iain Duncan Smith resigned from the job on Friday alleging that Downing Street was unfairly targeting the working poor. His comments create uncertainty over whether the Conservative pre-election pledge to make £12bn of cuts to the welfare budget will be now met, although Crabb did not specify how long the government would hold off from reducing benefits again. The trigger for Duncan Smith’s departure was the Treasury’s insistence that cuts of around £1bn a year to disability benefits be rushed out so that they could deliver savings for Wednesday’s budget, which at the same time offered tax cuts for higher earners. George Osborne has not appeared in public to defend his budget, which now has a £4.4bn black hole in its numbers, or rebut the charge of Duncan Smith that he produced a “deeply unfair budget”. However, David Cameron defended himself and the chancellor in the Commons on Monday, saying that they run a “modern, compassionate, one-nation government”. Crabb continued in the same tone as he confirmed the cuts to the disability benefit known as the personal independence payment would be totally scrapped, three days after government sources indicated a U-turn was on the way. In his first Commons statement in the job, the cabinet minister paid tribute to Duncan Smith and struck a conciliatory tone for the benefit of Conservative rebels who believe the Treasury’s budget was not fairly balanced. Crabb’s comments mean the government is standing by the cuts to disability benefit known as the employment and support allowance for the work-related activity group. He also hinted that the level of the chancellor’s welfare cap could be revised upwards, after Duncan Smith said the figure was “arbitrary” and risked dividing the nation. “The principle of a welfare cap is the right one … We do need that discipline. As we are required to do we will review the level of the cap at the autumn statement as the OBR requires us to do, but I want to repeat that we have no further plans to make welfare savings beyond those legislated for two weeks ago that we are now focused on implementing,” he said. Responding to the statement, Owen Smith, the shadow work and pensions secretary, welcome the U-turn as a “good start” but pressed him to go further in changing the government’s approach to welfare cuts by scrapping the bedroom tax and ESA cuts. Earlier, Cameron lavished praise on Osborne, in his first appearance since civil war broke out in the Conservative party, as he sought to fend off Duncan Smith’s criticism that the nation’s finances are being balanced on the backs of the working poor. During a statement on last week’s EU summit, Cameron launched into a list of the policies he has implemented that he said were taking children out of poverty and getting more people into jobs. He said that work was only possible because of Osborne’s stewardship of the economy and pledged to continue on the same path, despite Duncan Smith’s argument that the current balance of austerity risks dividing the nation. “All of this is driven by a deeply held conviction that everyone in Britain should have the chance to make the most of their lives,” Cameron said. “None of this would be possible if it wasn’t for the actions of this government and the work of my right honourable friend the chancellor in turning our economy around. We can only improve life chances if our economy is secure and strong. The chancellor has faced calls from Labour to resign and prompted anger among some Tory backbenchers after he was forced to withdraw planned cuts to disability benefits that would have saved £4.4bn. Osborne, whose leadership chances have been damaged by the fiasco, refused to answer an urgent question in the House of Commons about the unravelling budget figures, sending one of his deputies, David Gauke, instead. 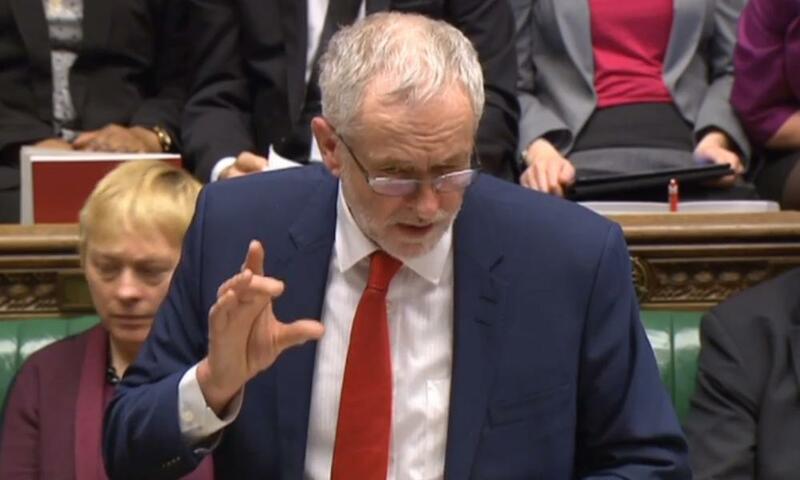 Responding to the prime minister’s defence of his and Osborne’s record, the Labour leader, Jeremy Corbyn, accused Cameron of “covering for his friend”. “The prime minister is here today. The work and pensions secretary is here today. Practically every cabinet minister is here today. Whatever has happened to the chancellor of the exchequer?” he asked. Corbyn said the budget had an “enormous hole in it brought about by a temporary retreat on the issue of the personal independence payment”. He said it was the “first time of his memory in parliament that a government’s budget has fallen apart in the space of two days”. The Labour leader urged Cameron to guarantee there will be no further DWP cuts and condemned the budget for having “inequality as its core”.